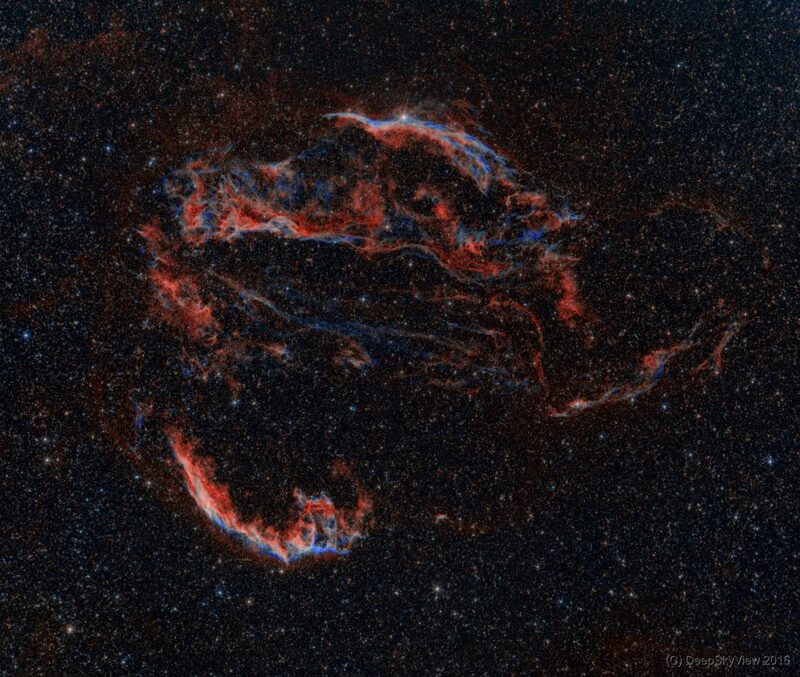 The complete Cygnus Loop or Veil Complex in a bicolor narrowband rendering. Recently, I posted a version of the same object taken during my summer vacation in the Mediterranean. I liked it, but was not perfectly happy with the raw data and the processing. So, back home I decided to do it again from scratch, from my light-polluted backyard (red zone). Using the same ancient Takumar 135mm f/2.5 lens, but this time stopped down to f/4 to improve sharpness and image quality. At the same time, I went for longer exposures and more subs, the above image uses 50 Ha and 35 OIII subs with 600 sec each. During processing I used drizzle integration which worked really well for the undersampled input data. I like this second try.